PDX-001 is a targeted nanoparticle for delivery of therapeutic siRNA for treating HER2+ and triple-negative breast cancer. The development is a collaborative work between PDX Pharma and the Biomedical Engineering Department of OHSU. The work has been funded by fast-track phase I/II SBIR awards from NIH/NCI, a phase I SBIR award from NIH/NCATS, and angel funds (the Prospect Creek Foundation and Schwab Charitable Trust). We report on a long-term stability of PDX-001 upon lyophilization. We have optimized the lyophilization process for PDX-001. The lyophilized PDX-001 can be stored stably for at least 6 months at -20 °C. 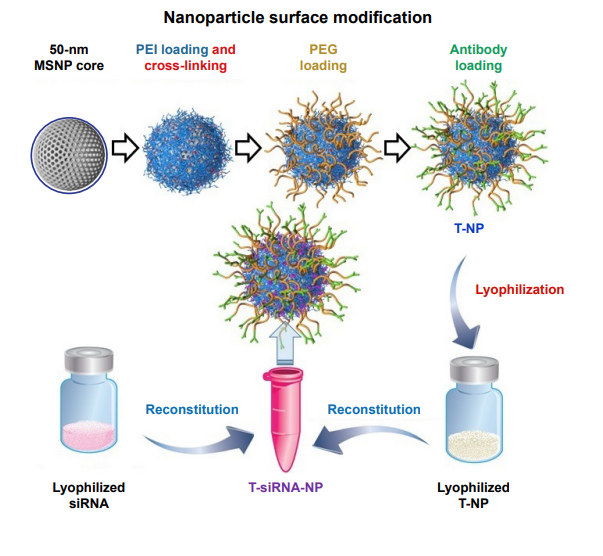 Toward future personalized medicine, the nanoparticle carriers were lyophilized alone and loaded with siRNA upon reconstitution by a few minutes of simple mixing in PBS. This two vial approach (i.e., siRNA and nanoparticle carrier in separate vials) is preferred in a personalized medicine setting since it permits interchangeable siRNAs for targeting different genes using the same nanoparticle formulation.